Why should you rent a Porta Potty for a Marathon and how much does it cost? For a single day expect to pay between $100 and $200 dollars per unit. So if your event has 3,000 runners signed up to race, you should plan to spend anywhere from $6,000 to $12,000 for the minimum amount of needed portable toilets. On a per person basis this comes out to between $2.00 and $4.00 per participant. Marathons are probably one of the most recognized competitions in the Country. In any given year, there are probably hundreds of marathons and foot races in communities throughout the US, many of which are likely to be held near you. 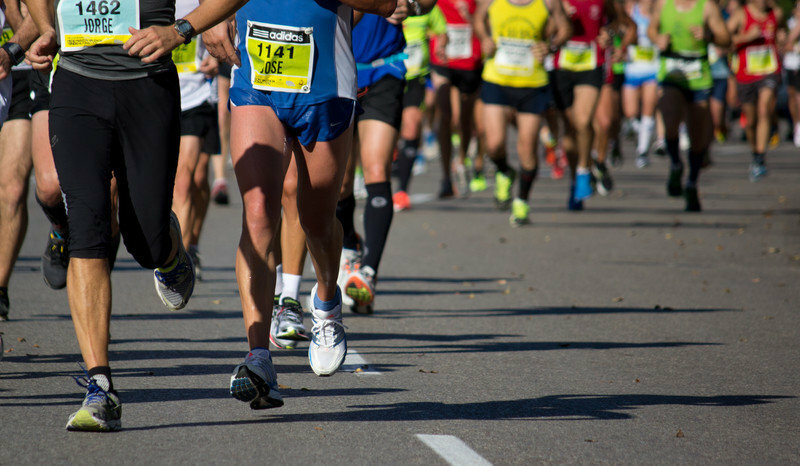 These types of events can draw large numbers of participants as well as crowds of onlookers seeking to cheer on their favorite runners. These runners may need a poo when running. Yes, it is entirely true marathon runners need to poop like all of us do. VIP Restrooms provides marathon runners with the ability to avoid having to poop while running. Our team of portable sanitation experts provide your marathons with accessible, clean and affordable marathon runner restrooms. With that said there is a lot that goes into planning a successful race. Event planners must consider several key factors in order ensure that a profit is made and that participants have a great experience. One such factor is ensuring that adequate restrooms are provided at the starting line and along the race route. Depending on the location of the marathon, there may not be local businesses or facilities willing to allow runners to use their restrooms during the event. Therefore, many event planners choose to provide portable sanitation in the form of porta potties and/or restroom trailers for the race participants and guests. Answering the question do marathon runners poop while running? No, unless they have an unfortunant accident. Typically marathon runners stop and use the port-a-potty rental, this may add time to their run, but is necessary to make up without being uncomfortable. A small investment in portable sanitation is sure to help improve the experience of all those involved in the race. Participants want to be able to focus on their run and utilize the competitive nature of the sport to push themselves to new personal bests without having to worry about where to go to the bathroom. For example, knowing that there’s a restroom at mile 6 will give runners the peace of mind to push ahead so that they can take a quick break when needed. Having restrooms onsite means that runner’s can fill up on plenty of water and sports drinks without worrying about what will happen when they find themselves having to go. This is much better for the runner than simply trying to find a local business or a random place in the forest to relieve themselves. Guests to the event will also benefit because they won’t have to travel too far to use a restroom. 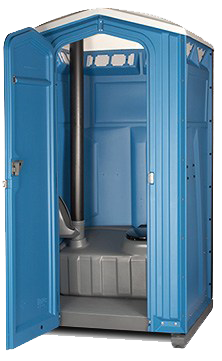 Porta Potties are inexpensive, easy to operate, and can go almost anywhere. For marathon planners one key question they often have is how many porta potties they need to rent for the event. There are many sources of information on this topic however a good rule of thumb is to rent 1 portable restroom unit for every 50 runners in the event. Depending on your budget and the size of the event, it may be wise to rent even more. This will help to ensure that everyone can take care of business adequately before, during, and after the event. Placement of the porta potties at the actual site is also very important as improper placement can lead to long lines or inefficient use. Generally speaking most of your porta potties should be placed near the starting line as they will get the most use there in the hour leading up to the race. However placing additional units along the race path every few miles is not a bad idea either. One thing you may be wondering is how much renting a port-o-john will cost. For a marathon and other road races where porta potties are only needed for a single day expect to pay between $100 and $200 dollars per unit. So if your event has 3,000 runners signed up to race, you should plan to spend anywhere from $6,000 to $12,000 for the minimum amount of needed portable toilets. 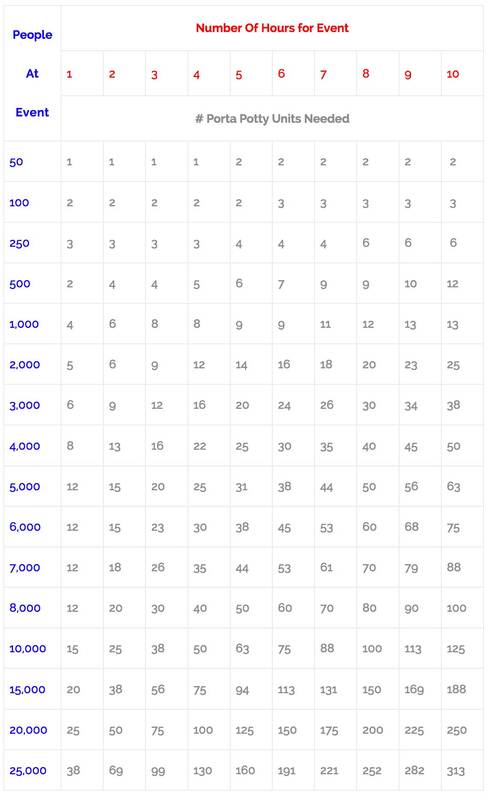 On a per person basis this comes out to between $2.00 and $4.00 per participant. This is a reasonable cost to pay especially considering that you are helping to ensuring the satisfaction and sanitation needs of the runners. In order to get a better handle on specific needs of the event you are planning as well as the prices for your area, it’s best to contact a local portable sanitation equipment supplier such as VIP rentals. VIP Rentals has a long history of providing porta potties to events all over the country. With a single phone call you can get a free rental quote to help you plan your next race.